Eight years ago, on November 8th, 2010, Sony Music and the Estate of Michael Jackson ignored the express wishes of the Jackson family, Michael’s collaborators and his loyal fans. They released a track that they falsely stated was sung by the King of Pop, the Eddie Cascio and James Porte produced ‘Breaking News’. Five weeks later, the song and two other fakes were commercially released on an album sold to millions of fans around the world. The album, ‘Michael’, is still available for purchase through physical and digital retailers, bringing continual profits to those who were complicit in the fraud. 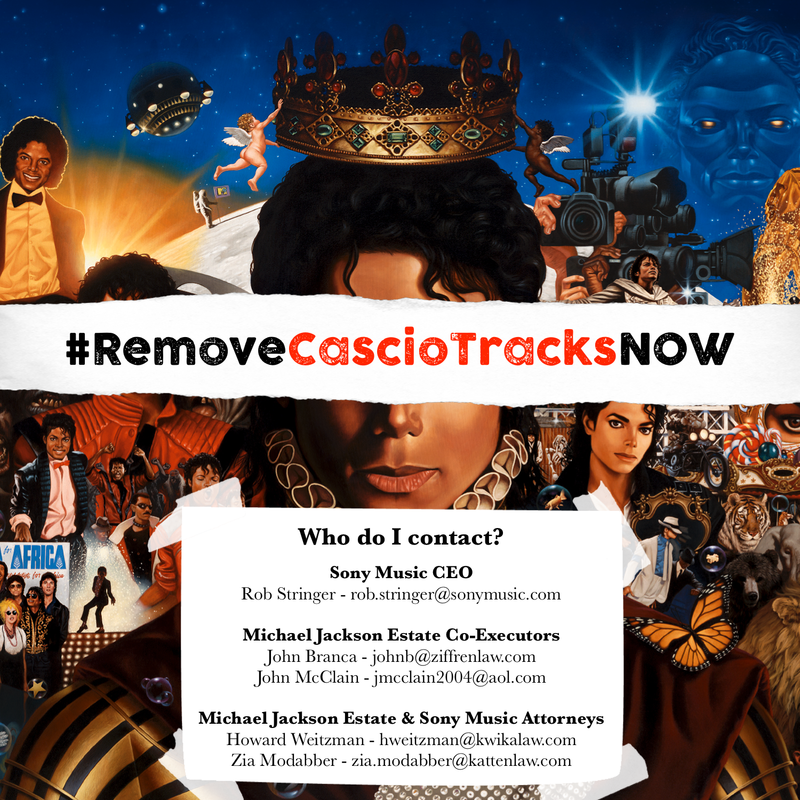 The time has come to once again raise our voice as one and remind Sony Music and the Estate that we will not stand for such disrespect and vandalism of Michael Jackson’s artistic legacy. Demand change. Demand they #RemoveCascioTracksNOW. We will continue our call to action through December 14th, the eight year anniversary of the ‘Michael’ album’s release, at which time we will request a formal response from Sony & the Estate. If sending an email, include the following recipients. December 14th will mark the eighth anniversary since the release of Michael Jackson’s first posthumous album, ‘Michael’. My name is [insert name here]. Unfortunately, I’m not writing to you today to express joy around your representation of the greatest entertainer who ever lived, like I’d one day hope to be able to, but to express my disappointment that there are still fake Michael Jackson songs for sale at retail outlets (online and physical) around the world even after eight years of protest from Michael’s family and fans. The songs I am referring to are known as the Cascio tracks, a set of songs written, produced and arranged by Eddie Cascio and James Porte, sung on by vocal impersonator Jason Cupeta AKA Jason Malachi, and then sold to Sony Music. Three of them; Breaking News, Keep Your Head Up and Monster, were included on Michael’s titular debut posthumous album in 2010. I’m sure you’re aware of the controversy that ensued after ‘Breaking News’ premiered on www.michaeljackson.com eight years ago. Regardless, any member of Michael’s family that has spoken out about this issue has said the songs are fake (including some of his beneficiaries). Most of Michael’s studio collaborators have confirmed the same thing and thousands upon thousands of his fans, yet the songs remain for sale. It concerns me greatly that Sony and Michael’s estate executors continue to defend the people who are responsible for this fraud, instead of defending Michael’s own beneficiaries and Michael’s artistic legacy itself. 1) All three Cascio tracks are permanently removed from sale in all retail stores around the world (digital and physical). 2) The Estate of Michael Jackson & Sony Music release public statements apologising to fans for selling fake Michael Jackson songs. 3) Fans who wish to receive a refund for the 2010 ‘Michael’ album are offered one. I appreciate the position you found yourself in, in 2010. In fact, many fans agree that the Estate and Sony are victims of the Porte/Cascio fraud too. Im sure there were contracts signed, but I see no excuse for ignoring the advice of Michael’s own mother, a beneficiary to his Estate. The right choice would have been to not include the songs on the Michael album and to challenge Eddie Cascio and James Porte in court, but alas, it’s not too late to do the right thing, even though eight years have passed. I hope that I don’t need to send a similar email to this one in the future, but I will continue to contact you until this matter is resolved. I would really appreciate a reply from someone this time. Let’s open the lines of communication around this. “Cause there’s a time when you’re right and you know you must fight.” – Michael Jackson. This entry was posted in The MJCast, Uncategorised and tagged #RemoveCascioTracksNOW, Cascio Case, Cascio Tracks, Eddie Cascio, James Porte, Michael, Michael Jackson, Sony Music by Jamon Bull (Admin). Bookmark the permalink. i didn’t purchase the album then (it’s not a Michael Jackson album), and i still don’t support it now. i refused to see This Is It when it was released. i know people were grieving the transition of Michael Jackson but the man released 11 official albums and two compilation/collections (at the very least), plus stuff like Thriller 25. The only reason i heard this first posthumous album is because Sony had it streaming in full (for free) on their website. So thanks, Sony. That’s the ONLY way i will listen to or watch any posthumous stuff, if i do at all. They do not get my money. There’s enough material out there to honor him already- and that IS stuff i paid for. Sony and the executors have no interest in taking any of these fake songs off. Why, when people will still continue to financially support the company? They already stated in a sworn deposition that they had no intention of removing the songs. If there was a total mass boycott where Sony made no profit, then you will see change, but that’s the only way.